In 400BC the Provençal French town of Marseille was a Phoenician Greek port called Massalia. Born there was the sailor and traveller Pythéas, also a mathematician, anthropologist and astronomer. In 327BC he wrote about his journeys; the first took him from Marseille to Great Britain and Iceland, his second took him from Marseille, through the Channel, to the Baltic Sea. He came to the mouth of the River Vistule, in today’s Poland, where much amber was traded. Pythéas met the amber traders - a people called the Cottini or Gottini. The Goths were traders, especially with the Greeks as early as 450BC, so much so that their language contained Greek words. Their goods included animal hides, furs, metals including gold and silver, uncut gemstones and jewellery, for they had learnt to work in gold and silver from the Syrians and the Persians. They introduced the ancient Greeks and Romans to amber. In return, they accepted pearls, fabrics, spices and weapons. They were short on weapons. They could make bronze, but had not yet learned how to temper steel. They had language, written figures, and skills in boat-building. They were an original and unusual people, and inspired the Egyptian Ptolemy to write about them. They were invincible warriors, attached to their traditions. They practised burial rather than incineration, unusual at the time. Their graves under tumuli, enclosed by ritual circles in stone, containing (as well as bodies) small oval vases, smooth and with small handles. In the women’s graves were fibules, bracelets and pendants in amber, and combs of a characteristic style. The graves of men held mostly arms. Pythéas tells us the Goths founded a town called Gothiscandza in Poland - the modern Gdansk. The legend is that their king Berig came across the Baltic sea to Poland on only three ships; the last one, called Gepanta, lagged behind. Its crew became a separate nation called the Gepidae, which means loiterers. Amber is part of the mythology of the northern Gods. The Goddess of beauty Freya, beautiful and golden-haired, married Odur and had two children, but her husband was always wandering and was unfaithful to her. She was so unhappy that she wept, and as her tears fell into the ocean they turned into amber. More scientifically, amber is fossilised pine-resin. A variety of pine used to grow on land that is now under the waters of the Baltic sea. During frequent storms, the amber was washed ashore, and could be picked up on the beach. It can still be found so, but most of today’s supply is mined, in Russia and Poland, where the Visigoths lived in the first century. Amber is slightly “soapy” and warm to the touch. 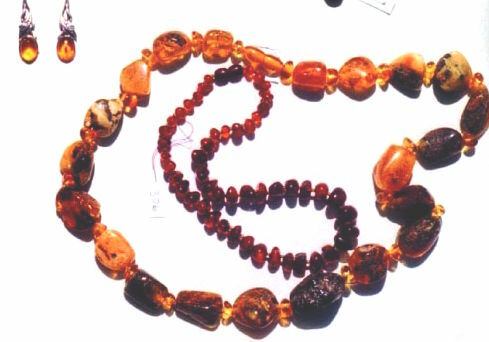 Amber can be easily cut or shaped; it was used for protective amulets and good luck charms before it was worn as jewellery, and in Asia it still is. Much antique amber is “natural” - a lump in the shape in which it was found. Each piece is unique, with its own markings, and the colour can range from lemon yellow to deep crimson. Amber was known to the Mycenians in 2000BC and was called “electron” by the Greeks, for it becomes electric when rubbed with a cloth. The ancient Greeks and Romans valued amber highly; they claimed it had mysterious powers and promoted good health. It is a natural disinfectant and the Turks used it to make the mouthpieces of pipes, including opium pipes, which could then be passed from one person to another without fear of infection. Amber is still used today by crystal healers; it promotes memory and decision making and wards off depression. It absorbs negativity and brings balance;wear an amber necklace if you work in a back-biting environment. It is also very calming, as I found out by accident; at a time of stress I was sorting my amber jewellery, and my headache disappeared. It’s said to lessen pain; the people in Languedoc, when their children are teething, give them necklaces of dark amber beads, which they wear till their teeth are through. I have seen this many times. 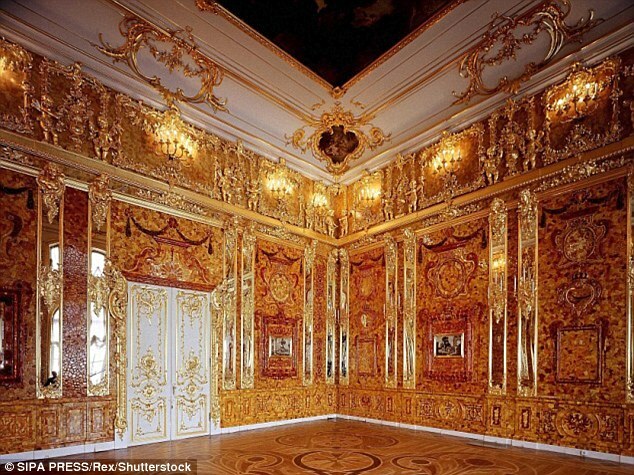 Visigothic jewellery and the magnificent "Amber Room." This was commissioned in1701 by Frederick of Prussia as a gift for the Czar Peter the Great of Russia; the room was shipped to the palace in St Petersburg. When the Nazis found it in 1941, they dismantled it, and 27 cases in the courtyard of Koenigsburg castle were the last that was seen of it. More about this mystery in "Barbarian Gold."